The first newspaper article printed following July 31, 1843. On the 26th of July, the British Warship named Dublin arrived. Rear Admiral Thomas is the Captain. He is the officer in charge of all of the British warships in the Pacific Ocean. When he received documents pertaining to Capt. Lord George Paulet aboard Victoria’s ship, and he heard clearly that the British flag was raised over these islands, he came quickly to restore the government to Kamehameha III. How fine is his aloha for the king, isn’t it! and for the citizens as well. 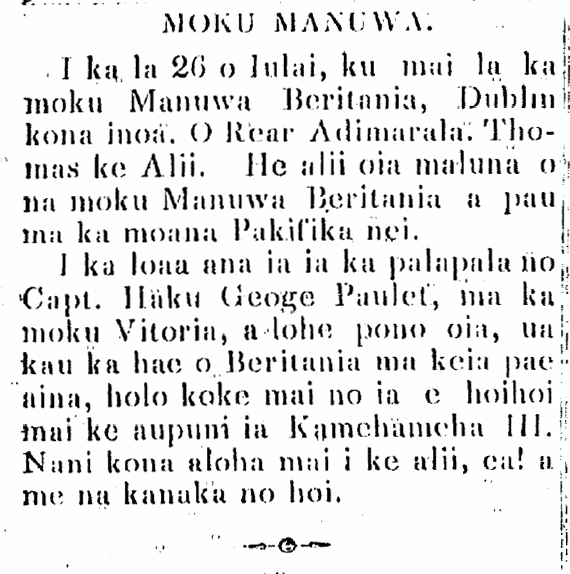 This entry was posted in Alii, Aloha Aina, Foreign Relations, Government, Holiday, Sovereignty and tagged Dublin (ship), flag, George Paulet, Kamehameha III, Kauikeaouli, La Hoihoi Ea, Restoration Day, Richard Darton Thomas, Richard Thomas, Victoria by nupepa. Bookmark the permalink.